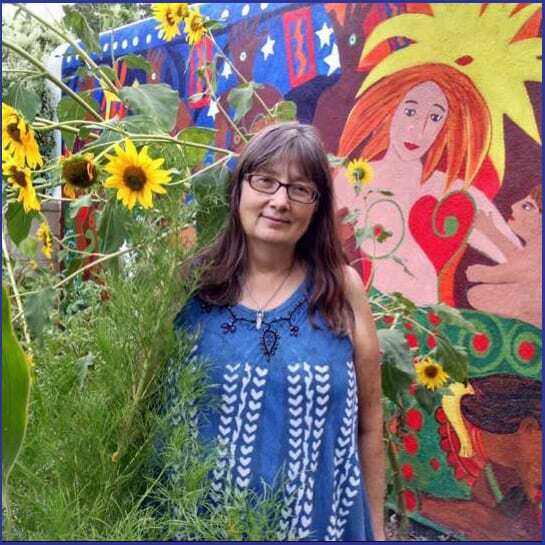 In 2018 she was designated a Local Treasure by the Albuquerque Business Arts Association and led a team of artists including Roe LiBretto and Joel Davis in creating a 24x90-foot mural that wraps around the Tortuga Gallery in Albuquerque. The mural was part of Mural Fest 2018 and celebrates the flora and fauna of Albuquerque’s Bosque, the natural wooded area that lines the Rio Grande River. In September 2017, her commissioned painting for the poster for ¡Globalquerque!, Albuquerque’s annual world music festival, was shown along with her Twelve String series which focuses on world music figures in playing string instruments. Earlier in 2017 she completed her second mural, a private commission, entitled We the People which depicts dancers from many cultural traditions along a 40-foot wall on Tijeras Road in the South Valley. In 2016, Denise won Best-in-Show in the Las Vegas International Juried Art Competition at Jana’s RedRoom Gallery with one of the paintings from her House of Cards series.